Snow-capped Mt. 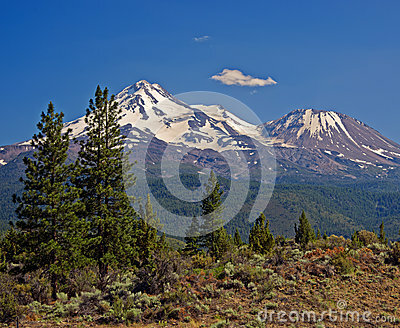 Shasta, framed by trees and forests, in the Cascade range of mountains in northern California, is the second highest volcano in the continental United States and a prominent landmark within the landscape. Located midway between San Francisco and Portland, Oregon, the mountain is a popular tourist destination, offering many recreational activities.